The shearer came on Monday to shear the mother ewes who gave birth in January and their lambs. It was good timing because the next day saw high temperatures well into the eighties. In the photo you can see lambs before, during and after the process. Before shearing the lambs have their gray “baby” wool and after their nice white regular fleece is exposed. 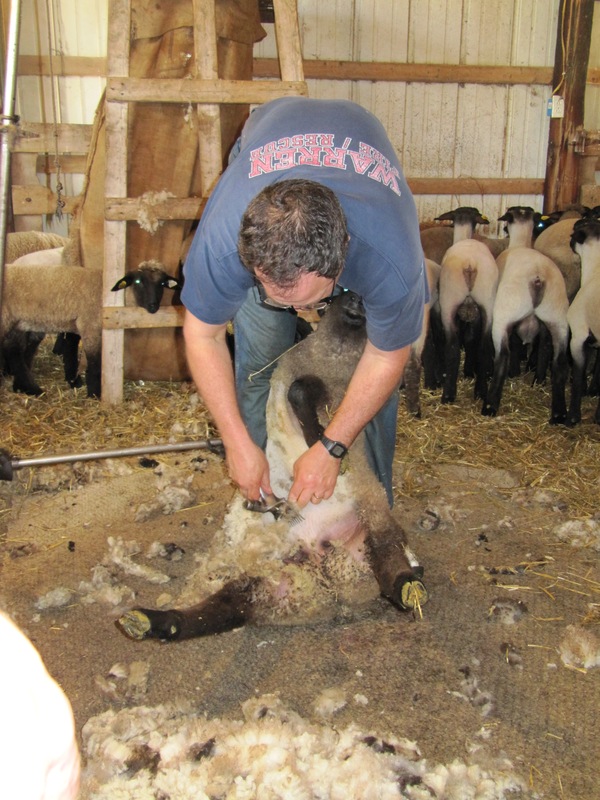 Scott and I used to shear the sheep ourselves but the shearer is a professional and does a much, much better job. He is fast, taking only about 3 minutes per sheep and could do them faster in a competition. He is easier on the sheep when holding them. Plus he is able to take the fleece off in pretty much one big piece. This keeps the wool cleaner and easier to stuff into the wool bag. You can see the burlap wool bag in the background. It will hold several hundred pounds. The wool has little value. In fact, the shearer buys the wool and we still end-up paying him for his services. Our breed of sheep (Suffolks) are much more a meat breed than a wool breed. What a good weekend. Yesterday was the first farmer’s market of the season. It was so nice to look up time after time and see another smiling, familiar face. Even with a bit of the rain there was great crowd. Getting to connect again with all our customers helps make all the hours of work more worthwhile. Today was more smiles as I was spoiled on Mother’s Day. Scott and the boys prepared two of my favorite meals (coffee cake for breakfast and beef burgers for lunch). We worked with the kids’ show lambs, read some books and worked in the garden (finally after all the rain it was dry enough). The young lambs pictured will look different tomorrow. The shearer is coming and they will lose all their grey fuzzy baby wool. The fleece underneath will be white with the hair on the legs and head staying black. A new record…tomorrow is the first market of the season and we are packed and all loaded before 10PM (thanks for the help Mom). I am going to celebrate with a bowl of ice cream and a pretty decent night’s sleep. Looking forward to seeing lots of familar faces at the market tomorrow. Good night! Two days in a row without rain, hooray! Everyday is different here on the farm and that keeps things interesting. While Scott fed the animals this morning, I did some prep work/planning for the electrician. We are in the process of adapting my grandparents’ old farmhouse into on-the-farm meat & food store. The wiring is about 30 years old so it was not powerful enough to run all our freezers. I measured and thought and thought some more about where all we would need outlets, switches etc. I am really looking forward to having a store right here in our hometown. We need to be more accessible to our neighbors and fellow west-central Indiana natives (plus the thousands of people who drive by every day on Highway 63)! 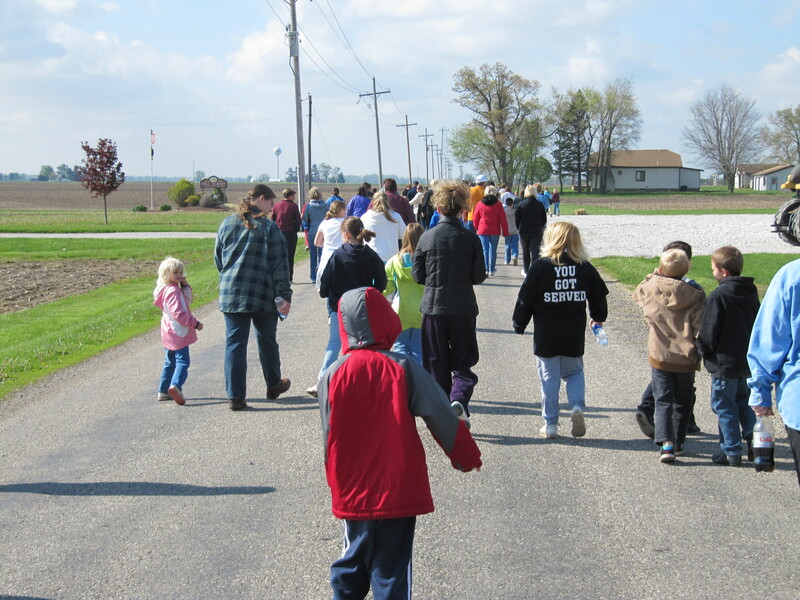 Then it was off to school to join our sons for the annual ACES (all children exercise simultaneously) walk. The red and gray coated wonder in the picture is Knic. With students, parents, teachers and friends there were probably 400 people out for a brisk 1 mile walk. We work long hours on the farm but the flexibility to join our kids for special events is priceless. After a quick lunch of roast beef sandwiches with Scott, I went to town. We are so fortunate to have a small town that provides all the services a person needs. I went to four different businesses (bank, hardware store, newspaper office and restaurant) and knew all the people working at each place. That makes for some good, friendly service. While I was gone, Scott put up more temporary fence and moved the mother ewes to fresh pasture. He then loaded two cattle and four hogs into our neighbors trailer for the two-mile trip to the butcher shop. The boys did their homework and I tried to catch up on emails and paperwork. Tomorrow will be totally different but still fun and interesting. Today was a full day since there were beef cutting instructions to write this morning, animals to feed and lots & lots of chicken and pork to pack in the freezer. My mom was kind enough to help since there was about 3/4 of a ton of meat to get ready for the next few weeks of market. She is a hard worker and her paycheck is quite reasonable (lunch of homemade country fried steak). 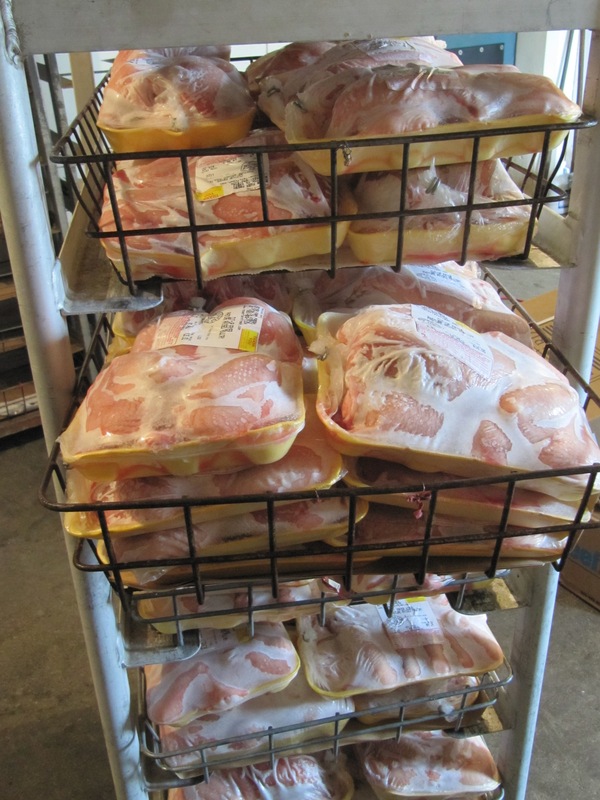 The cart to the left shows some frozen whole cut-up chickens. At the markets we will have whole birds, whole cut-up birds and pieces (just wings, or thighs, or boneless, skinless breasts, etc.) The freezer at the butcher shop cools to about -20 degrees, so the meat freezes fast without many ice crystals. With the busy day I was behind schedule with chores so I collected the eggs after supper. When the lactating mother ewes saw me walk by with a bucket (for the chickens supper), the sheep all came running in from pasture to be fed grain. I told the silly, wooly animals that I admired their optimism, but Scott had just fed them supper an hour ago. Guess you can not blame a creature for trying to get what he/she wants. 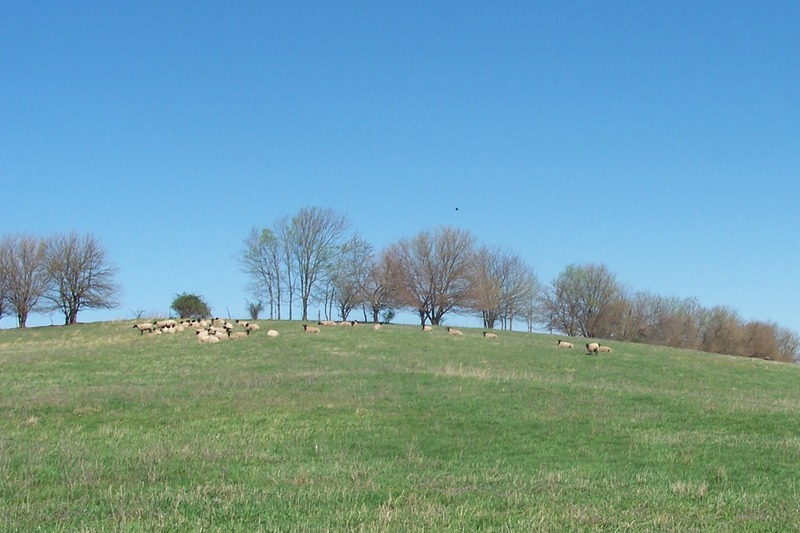 The mother ewes spread out over their spring pasture in the photo to the left. The blue skies we had yesterday left all too quickly and my wrinkled feet returned. This evening Scott and I loaded meat birds to be taken into the butcher shop tomorrow. The rain came on quicker than predicted so the second half of the birds were loaded in a light shower. At least we did not have to worry about the birds overheating. The birds are transported in sturdy plastic cages that hold 10-11 birds with space to spare. We removed the birds grain feed mid-morning so their digestive systems would be fairly empty during transport. 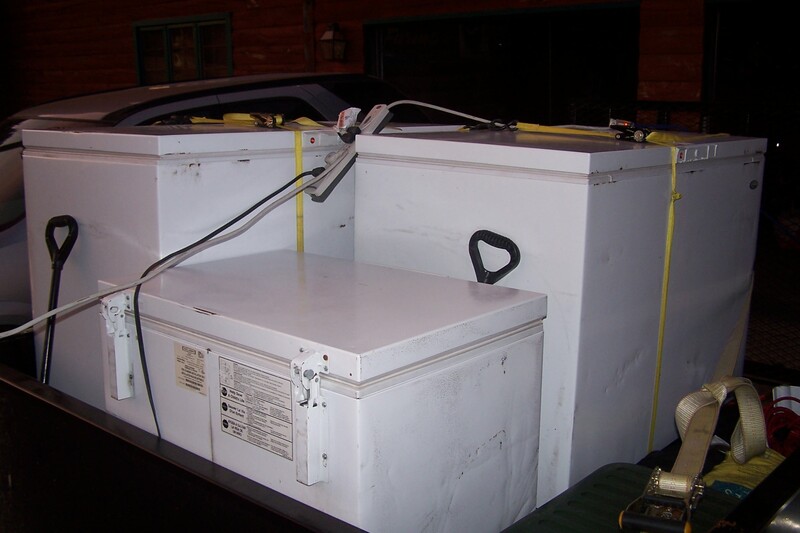 This keeps the birds much cleaner while traveling and it also makes the butchering process easier. All the April showers and thunderstorms gave me perpetually wet feet and therefore the wet foot wrinkles. Today was the first day in a long time I was dry all day while outside. For the month we had just under 11 inches of rain. This is about 7 inches more than normal. The rain should have helped the grass grow, but at times it was a bit too chilly even for the cool season grasses. 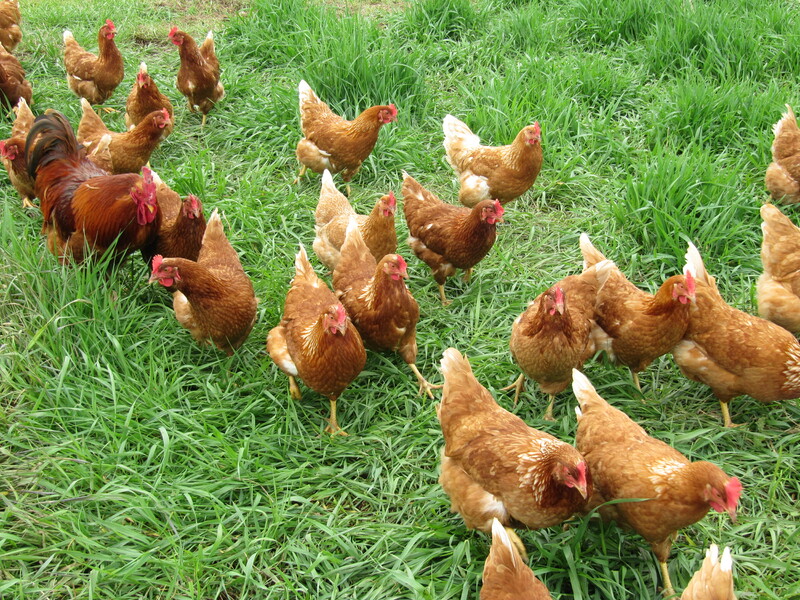 The cattle, pigs, sheep and laying hens did not mind the rain, although the hens’ feathers were a bit bedraggled at times. The meat birds did not care for all the rain, they just wanted to stay in their shelter and not go out to eat grass and look for bugs. The last 75 days have been ultra-busy. 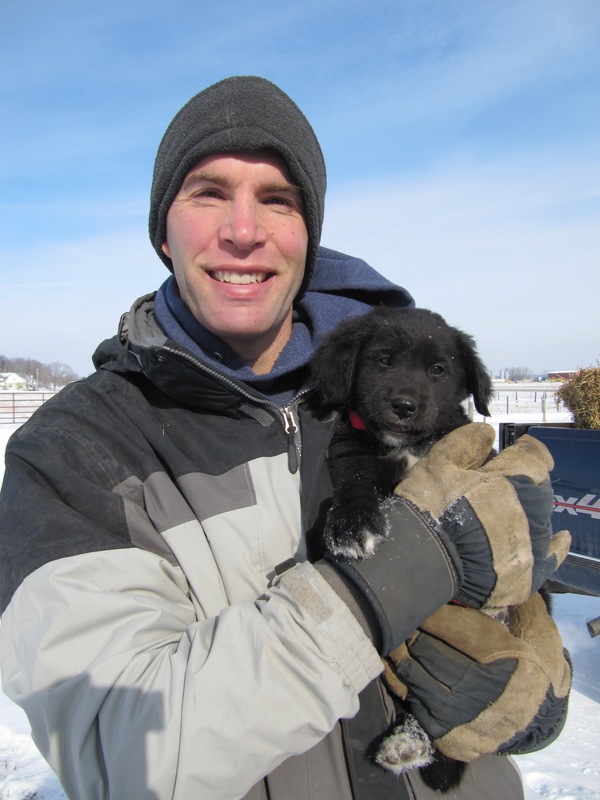 Caring for the animals during the big ice storm was more than a full time job and then just after the ice melted we opened a utility and cargo trailer dealership. I also started my four-year term on the local school board. That has meant plenty of evening meetings. I have a lot of passion about the potential of our community’s kids and can get pretty fired up about pushing to do our best for the students. It is good to have all the animals out on fresh spring pastures, but along with that comes the work and time commitment to put up temporary fence and rotate all the differerent livestock groups from paddock to paddock. With the crazy, high price of purchased feed, the more the animals can harvest themselves the better. Plus it is more natural and sustainable that way. We are by no means perfect in being wholly self-contained, put every year we work to get better (even when Mother Nature sends drought, ice and then buckets of rain). ICE, it is not nice. The local news stations have been calling it “Winter Storm 2011” but it has not been too bad. We were lucky and have not lost power except briefly last night. The second round of ice has made all the pastures like ice skating rinks with the only problem being the pastures are not level. After putting out fresh straw bedding for the ewes due to give birth in March, I slid on my buttocks from the barn, down the hill, and into the road. Thanks goodness for the padding of Carhart coveralls. Scott used the tractor to break through the ice and make walking paths for some of the sheep. We will need to make more trails tomorrow because some of the sheep are refusing to venture out of the barn. The cattle have been faring better, but they still move with caution. Lots of lambs have been coming the past couple of days. Sunday, Monday and today all started out with sets of triplets! Some of the triplets have been very wee (birth weights of 6 pounds) while others are closer to ten pounds. There are three more ewes due to give birth in the next day or two and then there will be a break until mid-February. Some of the oldest lambs are almost three weeks old. When we compare these “old-timers’ to the newborns, it really shows how fast young lambs grow. A high-performing lamb will double its weight from birth in 15 days. Speaking of growth, one of new puppies, Woody, has not doubled his weight in the last three weeks but he is up to a whopping 13 pounds. In his picture he was about 10 pounds. The two puppies together are eating a TEN cups of chow a day. I am not sure where all that food goes, but they sure are fun. BIG adventure yesterday. Sunday 8:30 AM we get the phone call..”Your cows are out by the Corner Stop”. The Corner Stop being the local gas station that is located right next to a residential neighborhood and a 4-lane highway. That is the kind of call that takes a few years off my life expectancy. Scott and I head out in separate vehicles to track the wayward beasts. He spots 6 of them in the one of our pastures adjacent to where they should be. I play tracker and follow the hoof prints to find the other 23 (yes, 23) missing cattle. Boy were we lucky the cattle made a right turn away from the highway and into the woods. I heard them before I spotted them. They were mooing and about 300 yards from the high school baseball field but I turned them back to the countryside before they could start training for the spring sport season. By this time our neighbors, the conservation officer and deputy sheriff had arrived to help. This is where patience had to be exercised big time. The cattle were not too nervous. My task was to keep the cattle fairly sedate and the helpers that way, too. I was ready to trail the cattle slowly all day around the countryside if that is what it took to keep the group together and calm. With many turns and twists plus four lines of fence to circumvent we walked/trotted back to the home pasture. There is no way people can force 23 calves to walk over two miles and go through a 16 foot gate hole. We had to gently guide the cattle back to their home pasture so patience was paramount. Boy it felt good to swing that gate shut behind the last tail and have everyone back safely! I have also had to call upon my patience for a more frustrating, but definitely less stressful situation. Last week a ewe gave birth to twins but had damage to one side of her udder. We did not have any ewes give birth to singles that could serve as adoptive mother to one of these twins. So I have been trying to train the lambs to nurse from a bottle. Right now the ewe can produce enough milk on one side to feed her two 12 pound lambs. The problem is in a few weeks before the lambs can eat a lot of solids but weigh 25-30 pounds each and are nursing a lot. Then there will not be enough milk and one of the lambs could starve to death. I want to supplement the lambs with milk replacer so they can get enough to eat when they are bigger. The problem is trying to convince them now to take the bottle when mom is supplying plenty. The lambs are making a little process, but it is slllooowww going. Hopefully, my patience will pay off! It is 4AM, what do you do? 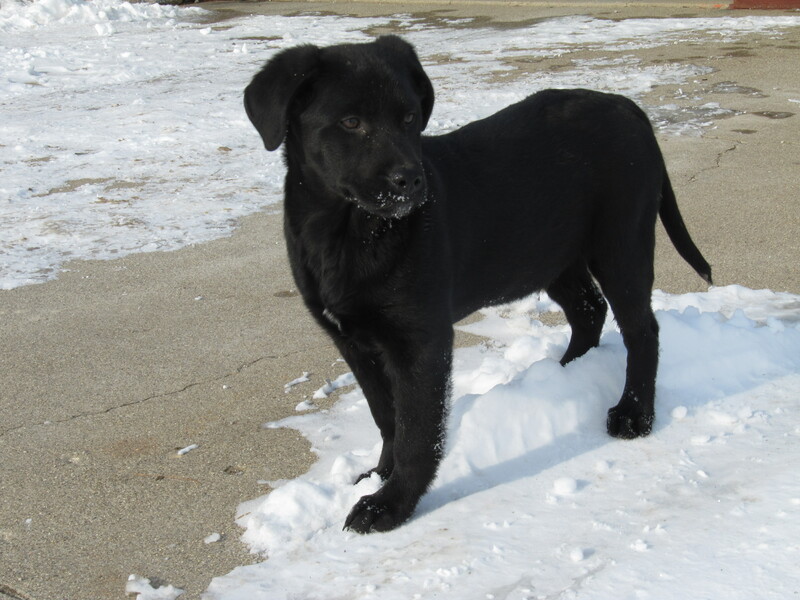 Pictured is Tucker, one of our new pups. Since we are getting up at all hours to check the sheep, we figured might as well make the most of our interrupted nights and get two puppies that would need to go out, too. A bit tiring, but efficient! Today I was on duty for the 2AM sheep birthing check. One ewe had given birth to a single since the last check by Scott at 10PM. Another ewe was in the process (I could see two little hooves peeking out). I moved the new arrival and mother to the heated “birthing booth”. The “birthing booth” is actually an old tack/storage room that Scott remodeled and insulated. With just a little milk house space heater the room stays around 40 degrees. 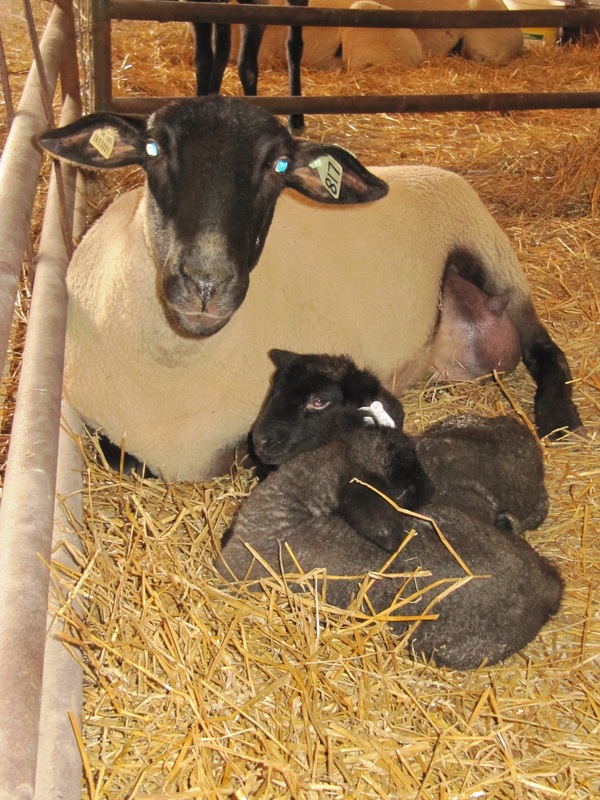 Birthing booth is actually a misnomer, because the sheep give birth in a larger unheated pen in the barn. Most ewes pace and paw as part of the birth process, plus there is a lot of fluid involved. So it is safer and cleaner to move them to the smaller, insulated room after the lambs are born. But the name birthing booth is so catchy, if not accurate, it stuck. After treating the new lamb’s navel with iodine and giving it a squirt of “go-go” juice (a vitamin/energy liquid), I stripped the mother ewe’s teats. The teats are protected by a waxy plug that fills the milk canal. Sometimes the plug is really lodged in place so we go ahead and strip or milk the ewe until the plug is removed and the milk flows. It is easier and more rewarding for the new lamb to get milk with the intial few suckles, instead of nursing without getting anything at first. While I was busy with the new lamb, the second ewe was in active labor. I watch from a distance as she worked for about ten minutes and then pushed her lamb out. We do not see everything birth, but it is good to be there in case the mother ewe is slow getting the membranes off the lamb’s head. This ewe did a good job so no assistance was needed. The vigor of a healthy baby is amazing; within 15 seconds the lamb had its head up and gave a little blat. Ultrasound had indicated the ewe was due to have twins so I returned to the house for about 30 minutes to give her time to clean the first lamb and refocus on delivering the second. When I returned there were two lambs already toddling about the pen. I moved all three to the birthing booth and did the usual newborn processing. Unfortunately, I discovered the mother ewe had damage to one half of her udder (aka a half-bagger). We will have to keep a close eye on the lambs to make sure they are getting enough to eat. By the time everyone was settled and I returned to the house, it was 4AM. My decision was go to bed and try to sleep for 2 1/2 hours or just stay up and get some office work done. I decided to take care of some email and paperwork, but I sure hope to squeeze in a nap later today!